The roller coaster ride that is Joe Turner’s extended second act as a recording artist continues and as 1948 comes to a close endures another sudden twist and turn that surely, by this point at least, few saw coming. Okay, okay, I peaked ahead, I admit it. Turner’s eventual reclamation as a premier artist, rising from the proverbial ashes of a career that at this point seemed commercially, critically and aesthetically all but snuffed out is in fact well known to those who have read beyond the first and second chapters of rock’s story, so it’s not like I’m imparting any daring insight into this matter. But rather than look forward, we here at Spontaneous Lunacy have been focused on looking backwards – that’s the whole point of the project after all, to start at the very beginning of rock and then work our way through the long twisted path that follows – and based on the first few returns from Big Joe Turner in rock’s opening chapters the results have hardly been promising. In fact, they’ve been downright uninspiring and schizophrenic. Hence the roller coaster analogy. Yet BECAUSE we know full well how this all turns out down the road with Turner we’re left to look for clues along the way that might suggest such an outcome was possible all along, in spite of his largely underwhelming efforts to date. Joe Turner is hardly alone in this regard either. Many of Wynonie Harris’s initial releases in the rock field left no indication he was poised to break through again after a long draught. Others, such as Dave Bartholomew who’ll go on in short order to be as responsible as anyone for rock’s ultimately successful creative and commercial leaps, saw his first few forays fail to make much of an impression too. In both of those cases the evidence presented as to their potential viability was pretty thin and so had things not worked out the way they had with them it might not have been anything to even make note of. But Big Joe Turner was somehow different. To start with he had a longer track record than those others, his career dating back to 1938 when he was the toast of New York when he helped launch the national boogie woogie craze with pianist Pete Johnson. While an artist of that vintage may have made him seem LESS likely to find success in a new genre of music coming along in 1947, by which time he was in his late 30’s, an age where he was conceivably old enough to be some of the best emerging rock artists fathers, he also had some very real advantages over the younger competition that needed to be taken into account. Namely the fact that the music they were scoring with was derived largely from the precedents Turner himself had laid down over the past decade. Rock ‘n’ roll – the stylistic side anyway, if not the cultural aspects emphasizing youthful optimism and restlessness – was music that Turner was born to sing. He had a robust voice that was second to none, a delivery that knew how ride the rhythm like few before or since, a vast war chest of songs easily adapted for any type of audience, and an unyielding vitality for presenting it all that was to be envied. Surely if anyone could defy the passing years, even if just briefly to show everyone involved just how to really score in this realm, it was Joe Turner. Yet Turner was scuffling once rock entered the picture in mid-1947, as he was in the midst of bouncing from record label to record label like a vagabond, cutting sides in every conceivable approach until he seemingly had lost all confidence in who he was at heart. When going strictly by his recorded output you get the sense that he had lost all sense of direction and there was no recent sign that he’d ever be able to find his way back to where he was most at home. That’s right, looka here because HERE is where Joe Turner was most at home all along. Smack dab in the middle of a vibrant uptempo rock song, hands firmly on the wheel steering it where HE wanted to go, rather than being subservient to his musicians or producers who attempted to swerve into another lane as had happened far too often with his records over the last calendar year. If the wildly divergent aims of the various record labels he found himself recording for during this stage of his career was a major hindrance, robbing him of a consistent musical vision with which to build his case for contemporary relevance in a rapidly changing marketplace… in this particular instance that transitory setting was a blessing. Turner had made the rounds of all of the independent labels with an open door policy these last few months. He’d cut sides for five labels in the past year or so and would wind up gracing the doorsteps of another eleven companies (give or take) before settling in at Atlantic in 1951 and fully reviving his career with years of solid hits that cemented his legacy as a guiding force in rock ‘n’ roll. But that was still well in the distance and for now he was wandering around aimlessly, looking for a port in the storm, a warm bed to spend the night before moving on the next day. While that type of divergent track record he was enduring throughout the late 1940’s is hardly the optimum path towards consistent output, each with their own session musicians, their own producers, their own market, region and vision for what he might succeed with for them, it DID at least offer him the opportunity to experiment and cast his line into a lot of different ponds. With most of them he didn’t catch any fish, nor even get a nibble on his line, but he did at least further build his résumé and get a chance to see what worked best from a purely creative point of view. Now as stated many times Turner excelled in both downhearted laments and uptempo rockers so usually it was one of the other that he was called on to provide. Lately however the confusion seems to have been over deciding on just one of those at a time and so often he’s found himself stuck halfway between the two, singing songs that beg to be done one way all while the band heads in the opposite direction. Here he’s got no such problem, which might be a bit surprising because the band he’s got was not among the most prolific in the studio that he’s recently encountered, but that too was probably a good thing because they were more willing to let Joe lead the way, which with Turner always is how it should be. 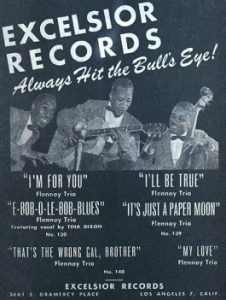 The group in question is The Flennoy Trio, a group that was hardly inexperienced as they’d been around since the mid-1930’s when they had an extended residency at the famed Club Alabam (where Wynonie Harris got his foot in the door as a professional and Johnny Otis later led the house band). In addition to their leader, pianist Lorenzo Flennoy, they’d featured some notable names within their ranks over the years such as trumpeters Teddy Buckner and Dootsie Williams, guitarist Gene Phillips, bassist Red Callender and sax man Jack McVea. Not all stayed very long but the list of names is certainly impressive and gives an indication of how well-respected a bandleader Flennoy was at the time. They also had some more visible successes, as Flennoy appeared in some movies along the way with such actors as Robert Mitchum, Kirk Douglas and George Raft, big stars all, while in his own medium he’d backed Mabel Scott, herself a very well-known singer, as well as Tina Dixon who we met earlier this month, on her first sides a few years back. The group themselves, now down to a trio, became much more prolific on record in the mid-40’s, yet nothing they did made many any commercial waves. 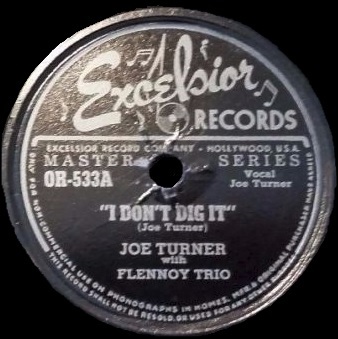 Flennoy’s last recording session would ironically be backing Turner for these sides on the small Excelsior label as 1947 wound down. Turner – as was his modus operandi at the time – signed to do the one session, just two songs, (for cash) as Excelsior, like every other record company then, was stockpiling sides to put out over the approaching recording ban that was about to cripple them all in 1948. To show how desperate they were to not run out of product they issued the two Turner cuts separately, with the flip-sides being just Flennoy’s group alone, that way they’d get to promote Joe Turner records twice and who cares what’s on the B-side (sorry Lorenzo). But it’s Lorenzo Flennoy who does what all of the bigger name backing musicians had been unable to do as of late which was provide Turner with a suitable arrangement that highlighted what Joe did best, and in fact adding immeasurably TO what Turner does best on the roaring I Don’t Dig It. As soon as Flennoy’s barreling piano is heard you feel reassured. Though cut more than a year earlier, just a few months after rock itself was born, this is a thoroughly modern sound, far more so than the dated tracks Turner had been saddled with of late. Flennoy is joined by a riveting boogie guitar line by Lucky Ennois that propels the song into high gear right out of the gate. Upon seeing the compatible running mates he’s picked up for this date Turner can finally breathe easy, knowing he’s now fully in his element and as a result he lets it rip in a way we haven’t heard yet out of him. His voice is rich and vibrant, roaring at full throttle like a man possessed, delivering a scalding put-down to a girl who’s more trouble than she’s worth. He airs out all of his grievances, which are pointedly true to life, yet unlike past complaints that he’s offered up to other wayward gals he’s encountered this time he’s fully in control of the situation, assertively laying down the law with a cocky sneer. The band replies to his diatribe by echoing his words at the end of each line, a scolding Greek chorus shaming the woman who’s caused Big Joe so much trouble. All the while they never once let up on the drive of the song, each of them playing in lockstep, hurtling along at a steady clip. Flennoy is as solid as a rock on the keys, playing as if in a frenzied rhythmic trance. When Enois takes his solos on guitar they hint of Chuck Berry in their tone a half dozen years before the fact and the effect all of this musical excitement has on Turner is palpable. If it’s possible to sound joyous singing about an impending breakup Turner certainly does, in fact he seems OVER-joyed at the prospects. In fact as listeners we’re not quite such which prospect he’s more excited over, the one featured in the storyline where he’s envisioning himself hitting the town without any ball and chain to tie him down, or when thinking of the musical possibilities opening up before him in his own career and realizing that with this tandem working behind him he might take over the world if given a chance. Of course, he wasn’t given that chance. Excelsior slapped some crinkled bills in his giant hand and bid him adieu. Knowing Joe he probably spent the cash on a bottle and some steaks to share with the band as a thank you for their work before they went their separate ways. The record inconceivably sat on the shelf for a full year, by which time the recording ban Excelsior was guarding against with this session had ended. Meanwhile during the wait Turner had gotten lost in the wilderness once again and seemed no closer to finding his way back to the light than he had before this side had been put down. In fact, he RE-CUT this same song at MGM in late 1948 with a much more high-powered group behind him and the results were atrocious, a jazzy-blues arrangement that stifled his personality, altering the entire mood of the story so he comes off as downright meek. MGM released THAT subpar side in April and for anyone who’d been tipped off as to the renewed vitality of Turner on a song called I Don’t Dig It without knowing which version it was to ask for (or without knowing he’d even CUT two versions a year apart), they were at risk for hunting Big Joe down and demanding their 79 cents back if they happened to pick up the wrong one. But THIS one was another matter altogether, a confirmation that all of his prodigious vocal talents and command over a song were still intact. It was a message to anyone in the industry who happened to be listening that should someone else come along who knew how to best harness it and pair him with musicians who shared the same vision that maybe he could climb his way out of the hole he found himself in and make a go of it again. Sometimes we tend to focus inordinately on the hits for determining the directions an artist takes and view those first rumblings of public interest as the breeding ground for the successes that follow, but that’s not always the case. In this instance it was a relative commercial failure on a record label he stopped at for a mere cup of coffee that pointed the way for Turner. I Don’t Dig It wasn’t a hit but for those who were fortunate enough to have heard it this was reason to believe he’d land those hits again sooner or later. 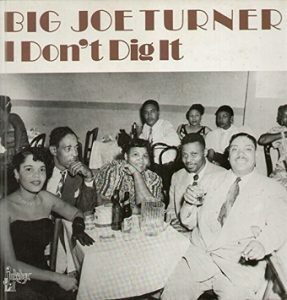 Leave a reply on "Big Joe Turner: “I Don’t Dig It”"